LAVERKIN – Dozing off while driving on state Route 9 near LaVerkin Tuesday evening resulted in a Nevada woman going off the road and crashing with damages such that she had to be cut out of her truck. 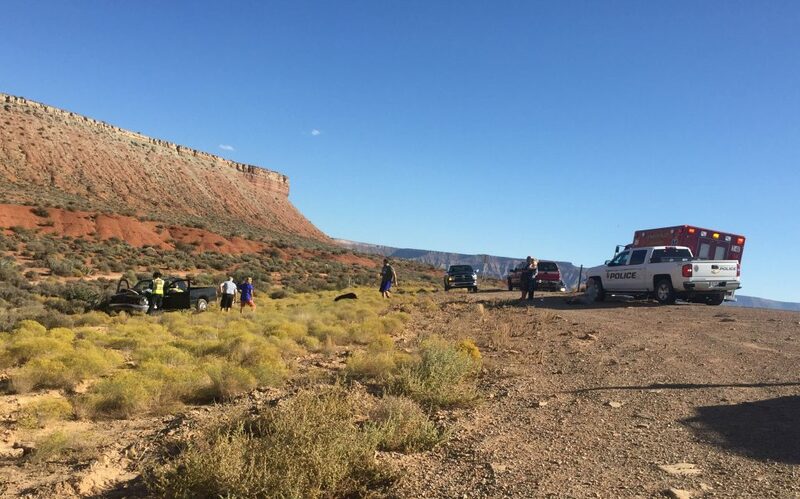 Around 5:45 p.m., a 54-year-old woman from Henderson, Nevada, was westbound on SR-9 toward LaVerkin when she fell asleep, Utah Highway Patrol Trooper Grant Hintze said. The woman’s vehicle, a black 2001 Toyota Tacoma, had been on a straight stretch of roadway until it curved. Witnesses told responders they watched the truck go off the road and down an embankment. It then dropped into a ravine where it crashed into a culvert. The impact damaged the front end of the truck while also sending the woman’s right foot under the dash, Hintze said. Airbags deployed at this time and apparently kept the woman, who had not been wearing a seat belt, from moving further forward, he said. The woman’s foot was “severely injured” and stuck under the dash, Hintze said. Unable to remove her foot and needing medical attention, firefighters from the Hurricane Valley Fire District ultimately used their equipment to extricate her from the vehicle. She was subsequently transported to Dixie Regional Medical Center in St. George by ambulance for care. No citations were issued in this case, Hintze said. After interviewing the woman at the hospital and comparing her statements to what the witnesses saw, it was determined she likely had fallen asleep at the wheel. This report is based on statements from law enforcement and emergency responders and may not contain the full scope of findings.